On Saturday night, June 16, Cruisin’ Destination Daytona was rockin’ as Elvis was “in the house”. 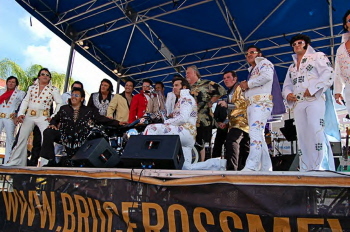 In addition to the highly popular Cruisin’ Destination Daytona, Bruce Rossmeyer hosted the “Ultimate Elvis Tribute” contest. Elvis impersonators from across the country converged on Destination Daytona to compete for the Ultimate Elvis title. Spectators of all ages came to check out the Elvis contest and view the sea of nearly 400 hot rods, customs, and specialty vehicles. While Elvis impersonators belted out a repertoire of Elvis songs at one end of the huge parking area, Dave “The Wanderer”, spun everyone’s favorite oldies at the other end. The restaurants, food court, pubs, and shops were all open and there was plenty to eat and drink, as well as shops to browse. Door prizes from Destination Daytona merchants, as well as YearOne, Doc’s Rod & Kustom, Total Performance Hot Rod Parts, and Diamond Back Classic Tires were given out throughout the evening. 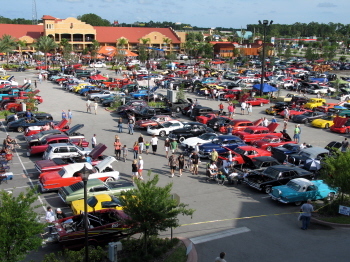 Remember the Cruisin’ Destination Daytona party happens the third Saturday of every month. The advertised starting time is 5 PM and the fun goes on until is over. Admission and registration is always free, and a good time “Crusin’ Style” is guaranteed. Elvis was “in the building” at Cruisin’ Destination Daytona. Destination Daytona just gets bigger and better. 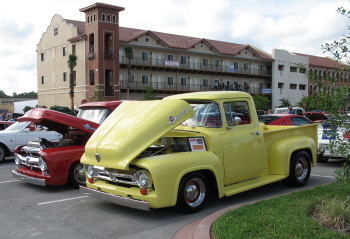 Did Ford offer different hood opening options on trucks in 1956? Not really, but these two fine examples of the famous F-1 sure looked good parked next to each other. Can you say “old style”? 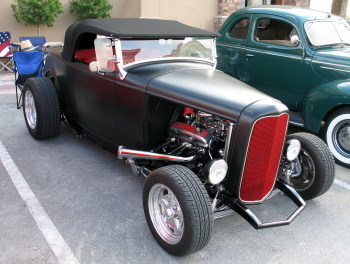 This fenderless, ’33 Ford Phaeton looks like it came right of the 1940’s hot rod handbook. 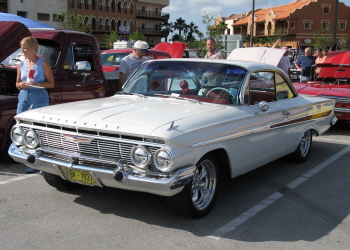 Butch Abbey tooled way down the East Coast from Long Island, New York in this really cool ’61 Chevy hardtop. The flawless maroon paint, the low stance, the shaved emblems, and a ’61 Oldsmobile grille make this one fine mild custom. Major modifications are not required to garner attention. 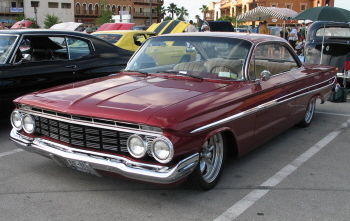 Randy Brinkley’s white over red, nearly stock 1961 Chevrolet Impala hardtop drew a crowd all evening. Randy shot down I-95 from Jacksonville, FL. 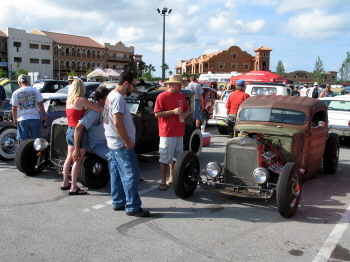 Just hangin’ out and havin’ fun a Cruisin’ Destination Daytona. 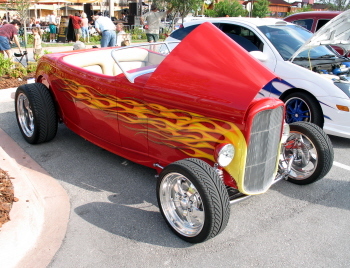 The guy’s at “Beachside Fabrication” built this really low ’41 Ford pick up. 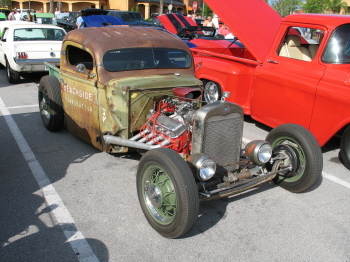 Not to many “rat rods” out there sporting highly detailed, big block, Chevys. At first glance you do not notice the well done suspension, good brakes, solid frame, etc.,etc. 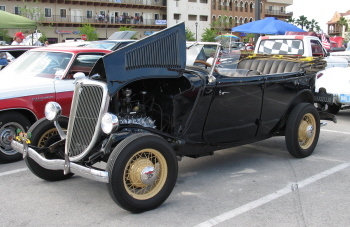 – not really a “rat rod”. 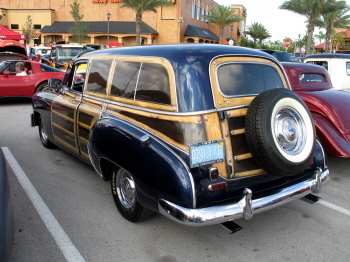 How about a 1951 Chevy woodie? Closer inspection shows the wood, as well as the rear side windows, are actually painted over a Chevrolet sedan delivery. Wow! 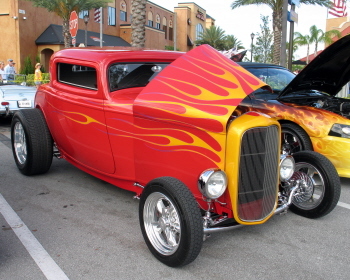 It just doesn’t get much better than a red, flamed, ’32 Ford three window. And Port Orange’s Robert Fisher knows that. 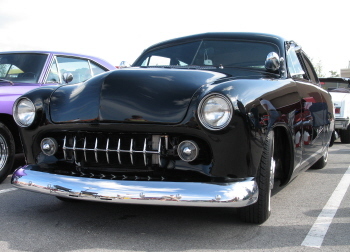 Rounded hood corners, frenched head lights, frenched grille opening, teeth, louvers, and super black paint make Lew and Diane Dedo’s shoebox Ford a step back in time. Rich and Cindy Puedie cruised up from Palm Bay, FL. There are a lot of open roadster guys in the Palm Bay area and while they are not afraid of a little rain, it was nothing but sunshine on this day. The man himself, Bruce Rossmeyer, the creator of Destination Daytona, cruises in this, one off, 1937 Ford, phantom, three window. The black on black beauty defies description. 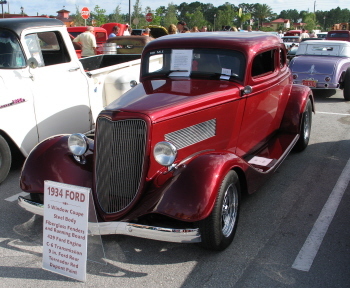 Torreador Red covers this steel ’34 Ford five window. Bob Myer’s ride over from Gainsville, FL must have been fun with 429 Cubic Inches of big block Ford under the hood. 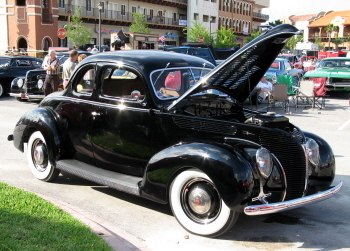 This black ’37 Ford coupe had all of the right touches, including the louvered hood, wide whites, trim rigs and small hub caps. Cool, really cool. 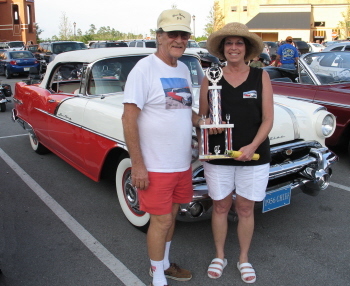 Bud and Dona Elliott show off their Diamond Back Classic Tire sponsored trophy for “Best Open ‘55-‘56-’57 Vehicle” Their Red and White 1956 Pontiac Star Chief convertible is pure class. Flawless red paint, a beautiful red leather interior, and a highly detailed big block Chevrolet highlight Jim Williamson’s 1955 Chevrolet DelRay. 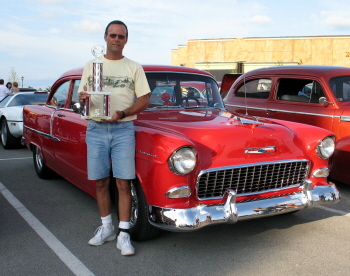 Jim took home the Diamond Back Classic Tires sponsored “Best Closed ‘55-‘56-’57 Vehicle”. 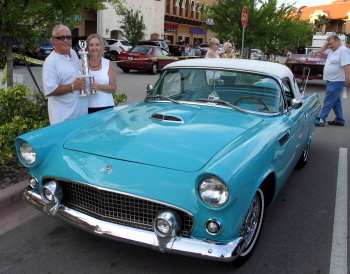 Paul and Sue Baker took the Diamond Back Classic Tires sponsored “Merchant’s Pick” trophy back to Ponce Inlet, FL in their beautiful 1955 Thunder Bird. 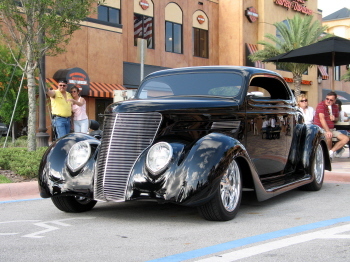 Blacki Suede and his wife Jo Anne tool around East Central, FL in their traditional, satin black ’32 highboy. 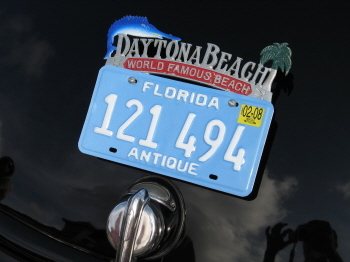 “Daytona Beach” license plate topper says it all.